MOSUL, IRAQ, June 8, 2017: For months, soldiers, civilians and aid workers in Iraq have been reporting Islamic State attacks using homemade chemical weapons. 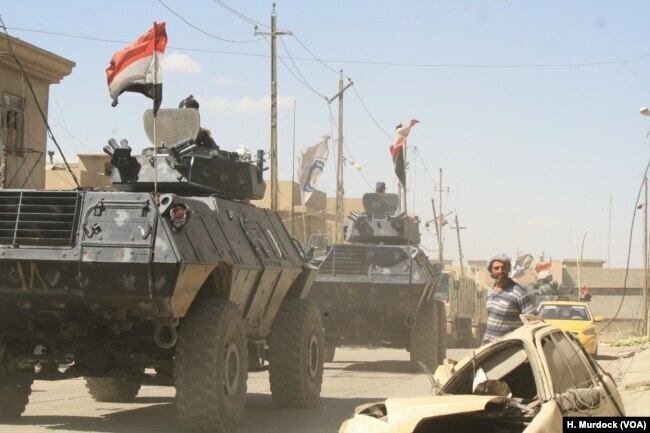 On June 4 in Mosul, militants fired a poisoned mortar at Iraqi forces in a failed attempted to rescue other IS fighters trapped in battle. Thirty-year-old Private Hussien Hamza of the Iraqi Army’s 73rd Brigade told VOA about his experience in the battle. He spoke in Arabic. The operation began at 3:30 a.m. We moved quickly on foot, keeping low and running through the neighborhood. The roads in this part of Mosul are too narrow for humvees so we stayed as close to the walls of the houses as possible for cover. 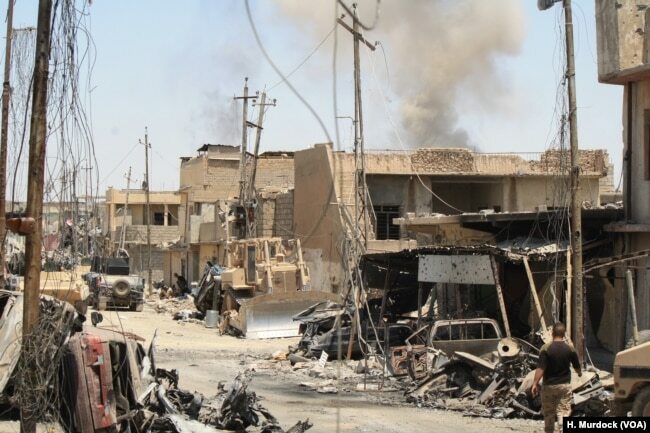 Islamic State militants mostly retreated, but they fired at us as they fled. They were mainly using grenades and mortars, but also plenty of machine guns and sniper rifles. We saw militants prepare to detonate a car bomb and fired at them as we ran. We defused the bomb. By early afternoon, we had moved nearly a kilometer in, and seven militants were trapped in a house just behind our new frontline. About 10 of us went in, and we fought for hours using hand grenades in close quarters. The militants wore all black. It looked like traditional Afghan or Pakistani clothes, but they didn’t appear to be Afghan or Pakistani. They cursed us when they saw us. We cursed them back. That really pissed them off. By 5 p.m. we killed all seven of them. One of them looked Chinese. We hadn’t stopped for food or water since the operation began, but we weren’t tired. Other militants were still firing at the house, trying to rescue their team. A missile hit a car outside the house and it was on fire. Three mortars dropped and poison gas blew in our faces. Within seconds I was blinded by the tears streaming down my face and liquid poured out of my nose. White bubbles came from my mouth. I could hear other soldiers coughing. Some of the men grabbed me and two other soldiers and brought us to a field clinic. Medics said our cases were too advanced to be treated there and they transferred us to a hospital, where they told us we were hit with a chemical attack. I passed out. After two days of oxygen and injections we were released back to the frontlines but my eyes still hurt and my body is shaking. They say I need to see an eye specialist.